Abstract. The study of resonances in systems such as periodically forced oscillators has traditionally focused on understanding the regions in the parameter plane where these resonances occur. 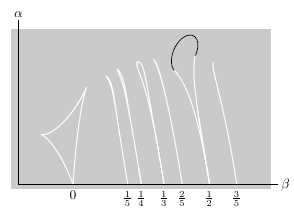 Resonance regions can also be viewed as projections to the parameter plane of resonance surfaces in the four-dimensional Cartesian product of the state space with the parameter space. This paper reports on a computer study of resonance surfaces for a particular family and illustrates some advantages of viewing resonance regions in this light. The original preprint was posted in 1993 at the Geometry Center as GCG 70. The Geometry Center Website is maintained now at the University of Illinois. The link to the preprint is broken.